Today’s Saturday Supplement is another in the occasional Meet the Roaster series. Continuing with the Glasgow/Commonwealth Games theme, we’re at Glasgow’s Dear Green Coffee, roasting high-quality coffee in the heart of the city since 2011. Dear Green roasts two main espresso blends, Goosedubbs and Treron (a seasonal blend), various bespoke blends and 16 single-origin beans. These are mostly for filter, which forms an ever-increasing percentage of Dear Green’s growing output. 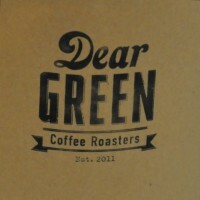 I first discovered Dear Green Coffee when I visited the much-missed Razzo Coffee in Edinburgh. I met Dear Green’s founder and head roaster, Lisa Lawson, at the London Coffee Festival in 2013, when, against all the odds, she persuaded me to try her take on the traditional Italian caffè corretto. This was a single shot of the Treron blend, taken with a drop of whisky and honey. To my even greater surprise, I really liked it! Given that I can’t stand whisky and hate having sugar in my coffee, it’s high praise indeed! I met up with Lisa again at this year’s London Coffee Festival, when we arranged for me to visit the Dear Green roastery as part of my trip to Glasgow on behalf of Caffeine Magazine. November 2015: Dear Green has moved to a new, much larger roastery near the Barrowland Ballroom. Unfortunately I’ve not had time to check out the new roastery on my last two trips to Glasgow. You can see what I found out after the gallery. Dear Green’s right in the heart of Glasgow, in a small unit just north of the Clyde and minutes away from the main stations. A few steps to the east is Glasgow Green, for many centuries the city’s only green public space. Although Lisa caught the coffee bug when she was working in Australia, packing coffee for a then little-known operation which went on to become Toby’s Estate, she’s a Glasgow girl and Glasgow runs through the heart of Dear Green and everything it does. Dear Green’s name is a play on Glasgow, which means “Dear Green Place” in Gaelic, while the Goosedubbs blend is named after Goosedubbs Lane, just around the corner from the roastery. Lisa’s a great ambassador for speciality coffee in Glasgow and beyond. During my visit for Caffeine Magazine, I was indebted to Lisa, who took time out of her busy schedule to ferry me around various Glasgow coffee shops, introducing me to several places that I otherwise wouldn’t have thought to try. Throughout my two-day visit, it was clear that Lisa (and Dear Green) are held in very high regard in Glasgow. I was also struck by her boundless energy and enthusiasm for speciality coffee. In that respect, she could be said to be Glasgow’s equivalent of the subject of last week’s Saturday Supplement, Edy Piro. I don’t think that Dear Green has a mission statement, but if it did, it might well focus on bringing speciality coffee to the non-specialist market. This is something I’ve seen in quite a few speciality roasters, a desire not just to supply the best speciality coffee shops, who show your beans off to their fullest potential, but to supply the next tier down. Here you find cafes, bars and restaurants where you wouldn’t necessarily expect to find great quality coffee, but why shouldn’t they have great coffee too? Dear Green supplies some of the best Coffee Shops in Glasgow, including the likes of Riverhill Coffee Bar and Laboratorio Espresso. However, what impressed me was all the non-speciality places that Dear Green supplies, which Lisa kept pointing out as she drove me around. A great example is the fantastic Veldt Deli, which Dear Green supplies with its own bespoke African espresso blend. Of course, it’s more than just supplying the beans: Dear Green’s commitment goes beyond that. There’s training, of course, plus equipment supply (Dear Green is partnered with La Marzocco). Naturally enough, this is an on-going commitment: there’s little point in training the staff when you first start supplying the beans or install a machine, forgetting about them after that. I was struck by the commitment of Lisa and her staff to get out of the roastery on a regular basis to meet with their customers. As with most businesses, it’s the personal relationships that really count. Talking of which brings me to another of Lisa’s passions: ethical sourcing. Lisa makes regular sourcing trips to various coffee growing-regions to forge direct relationships with the small farms supplying Dear Green’s coffee. On her latest trip to Guatemala, she brought back some coffee cherry jam from Finca Filadelphia in Antigua which we had on some (Coffee Spot) scones. I had no idea you could make jam from coffee cherries (otherwise a waste product) but you can and it’s delicious! Liked this? Then don’t forget to check out the Coffee Spot Guide to Glasgow for more great Coffee Spots. If you’d like to know more about Lisa, the founder of Dear Green, then try this interview, part of an awesome series by Scotland Coffee Lovers on women in speciality coffee in Scotland. For more about Dear Green itself, there’s this article on Dear Green and the circular economy. Don’t forget that you can share this post with your friends using the drop-down “Share” menu below. This entry was posted in Glasgow, Meet The Roaster, Roastery and tagged include by Brian Williams. Bookmark the permalink.